TUCSON, ARIZ. — The Navy and Raytheon are close to signing a deal to integrate a new sensor into the Tomahawk Land Attack Missile to allow the missile to attack moving targets at sea, the head of the Navy’s Tomahawk program told USNI News on Tuesday. Once the deal is complete, Raytheon will start work to craft and install a sensor to convert a yet-to-be-determined number of Block IV TLAMs into a Maritime Strike Tomahawk variant, said Capt. Mark Johnson, Naval Air Systems Command PMA-280 program manager. “We’re signing the contract now, there will be a couple of year development effort to determine the configuration of the seeker to go into the missile and a couple of years to take it out and test it to accurately know what the performance is so the fleet will have confidence in the system,” Johnson said following a ceremony celebrating Raytheon’s delivery of the 4000th TLAM to the Navy. Raytheon and the Navy are still determining the type of sensor that they’d likely use, company TLAM program manager Dave Adams told USNI News on Tuesday. He indicated that the final product could be a multi-mode seeker with a mix of passive and active sensors. The sensor will be installed into some Block IV missiles doing their midlife recertification in addition to other upgrades. “We’re upgrading the radio, the harnessing and the antenna for the communication. So every recertified missile will get an upgraded navigation and communication,” Johnson said. The missiles will also receive an unspecified upgrade to allow TLAMs to operate in a GPS denied environment and a warhead upgrade. The recertification effort for the Block IV weapons will start in 2019 with the first MST variants to enter the fleet in the early 2020s. The MST was born in the midst of the surface Navy’s 2015 distributed lethality push and its effort to acquire more offensive weapons for the surface force. While the Navy fielded an anti-ship variant of Tomahawk shortly in the 1990s, the sensor technology wasn’t sophisticated enough for long-range target discrimination and the weapons were quickly converted to standard land attack variants. 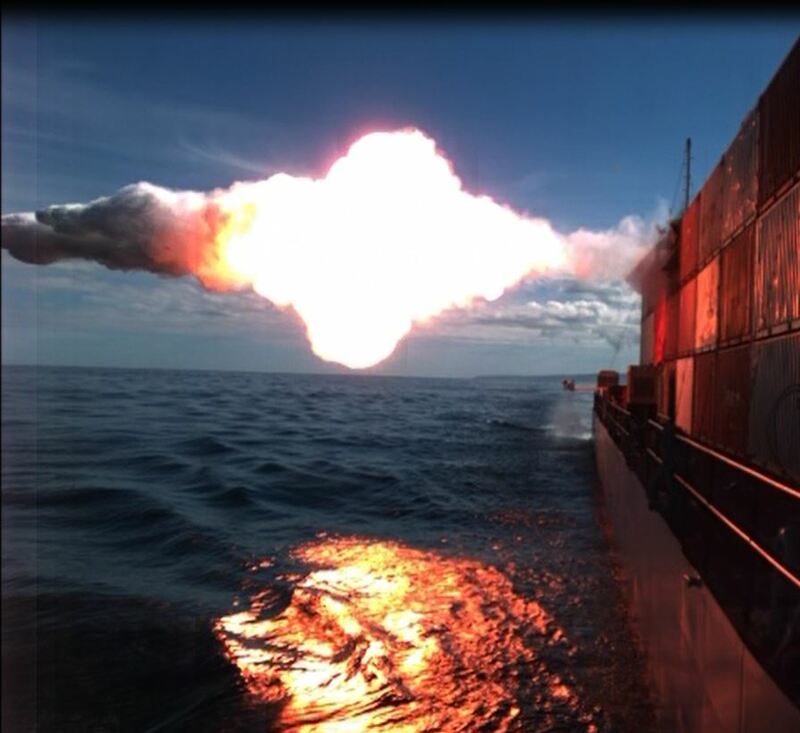 However, a 2015 NAVIAR test of a Block IV weapon – with external guidance – proved that a Tomahawk could hit a moving maritime surface target at range with more assurance than the old Tomahawk Anti-Ship Missile (TASM) sensors. Shortly after the test, then-Deputy Secretary of Defense Bob Work praised the test and used it as an example of the thinking behind the Third Offset Strategy in developing new capabilities at minimal cost. “This is potentially a game changing capability for not a lot of cost. It’s a 1000 mile anti-ship cruise missile,” he said.